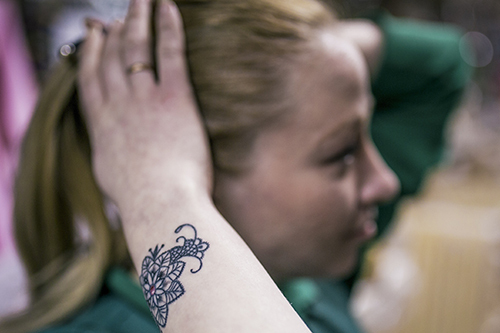 UFA, Russia -- Flowers and butterflies are what a Russian tattoo artist gives to victims of domestic violence to help hide the physical scars from abusive relationships they want to put in the past. 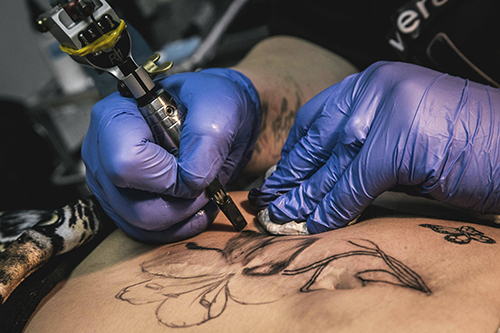 Yevgeniya Zakhar posted an ad on her social media page last year offering to ink abused women for free after she heard about a Brazil tattoo artist already offering the service. Soon, she was flooded with requests - and got so stressed hearing her clients' stories of beatings and burnings that she had to limit the number of women she sees to one day a week. "I didn't expect to be inundated with visits," said Zakhar, 33, who works in Ufa, a city about 1,200 kilometers (745 miles) east of Moscow. "I had to work on two to four clients a day. It's really scary, scary to look at this problem and hear what people are saying." Earlier this week, President Vladimir Putin signed into law a controversial bill decriminalizing some forms of domestic violence in Russia. The measure makes battery on a family member punishable by a fine or a 15-day arrest, if there is no bodily harm. Domestic violence is a long-standing problem in Russia. Police estimate that about 40 percent of all violent crimes take place within families. In a survey last month by the state-run Russian Public Opinion Research Center, 19 percent of respondents said "it can be acceptable" to hit one's wife, husband or child "in certain circumstances." Supporters of the new law insisted it does not encourage or sanction violence, but instead gives families a chance to reconcile after what the bill's co-author, Olga Batalina, described as an "emotional conflict, without malice, without grave consequences." 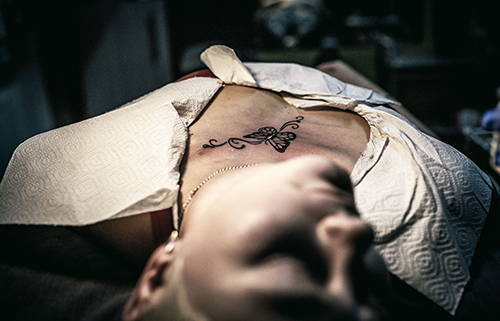 Zakhar's clients usually pick butterflies or floral designs to cover the visible signs of abuse. The clients confide in the artist, sharing the horrors of relationships that went from bad to violent to vicious. Turning the scars into something of their own choosing boosts the women's self-esteem and helps them gain new perspectives on the trauma, Zakhar said. "Girls are willing to talk, often because it will be the last time they speak about the scars," she said. "They don't talk about it later because they will be talking about their beautiful tattoo, not a scar." Katarina Golovkova underwent eight hours of surgery to save her arm after her boyfriend threw her against a window five years ago. 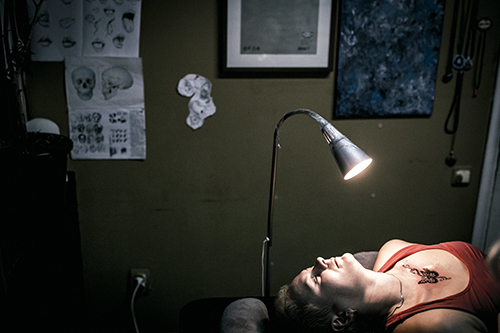 She thought about getting a tattoo to cover the scars, but didn't have the courage to visit a tattoo artist before she spotted Zakhar's ad. "People saw it and asked, 'What is this scar about?'" Golovkova, 29, recalled. "It was a constant reminder. You see this arm every day, it's there. At least now I can freely open it up, and people say, 'How cool!'" 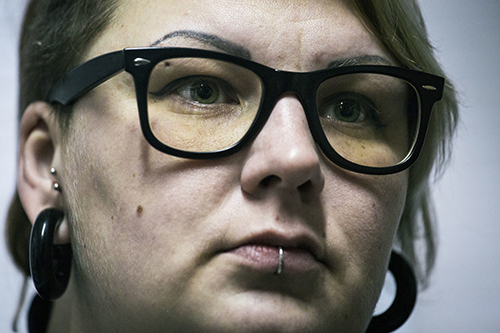 Golovkova, who was stalked by her boyfriend for weeks after she finally left him, hadn't heard about Russia's new domestic violence law, but she does not like the idea. "It's wrong. It all starts with one slap," she said. "You forgive them once, and it gets worse. You can't forgive such things. They will happen again." 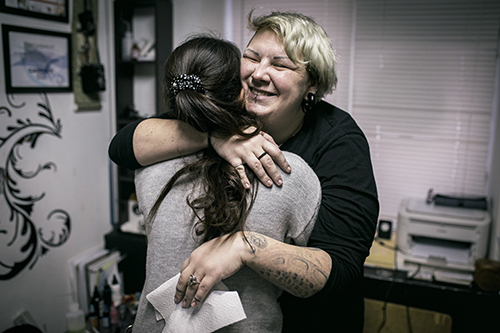 Zakhar said she has tattooed more than 1,000 women at no cost since she started reaching out to abuse victims last year. She says not one reported receiving help from police. "The girls say, 'What's the point? Why go to the police if they are not helping?'"